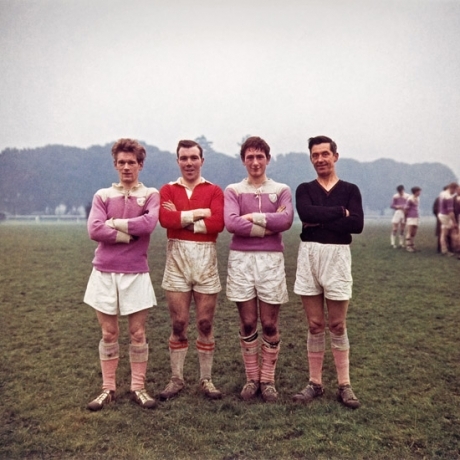 Phoenix Park on a Sunday, Dublin, 1966. Anna and Emma, Dublin, 1966. Queensboro Bridge, New York, 1964. Secretaries in Rawlings Park, Washington, 1965. 59th St., New York, 1964. Beauty Palace, New York, 1963. Harlem Church, New York, 1964. Andy Warhol (in his Studio with Elvis Presley Print), New York, 1962. Royal Hospital, Kilmainham, Dublin, 1966. Couple, Jardin de Luxembourg, Paris, 1967. The President's Car, Washington, 1965. Lee Krasner's Shoes, Pollock Studio, Long Island, 1988. Haughwout Building, New York, 1965. 42nd Street, New York, 1964. Brocolli (Still Life No.3), New York, 1996. Hommàge a Zurbarán (Still Life No. 6), 1997. Danziger Gallery is proud to take on representation of the Estate of Evelyn Hofer and mount the first large scale American retrospective of this important and pioneering photographer. Evelyn Hofer was born in Marburg, Germany in 1922 and died in 2009 in Mexico City. In the years in between, Hofer created a body of work that both looked back to the tradition of August Sander and anticipated the color work of William Eggleston, causing her to be called "the most famous unknown photographer in America" by New York Times art critic Hilton Kramer – a devout supporter of her work. Hofer's work has influenced such photographers as Thomas Struth, Joel Sternfeld, Adam Bartos, Rineke Dijkstra, Judith Joy Ross, and Alex Soth. There have been retrospectives of her work at the Musée de l'Elysée in Lausanne (1994); the Aarggauer Kunsthaus in Switzerland (2004); and the Fotomuseum The Hague (2006). Last year her work was shown in Munich's Villa Stuck as part of the Goetz Collection in the exhibition "Street Life and Home Stories" alongside the work of the photographers William Eggleston, August Sander, Diane Arbus, Thomas Struth, and Nan Goldin. When Hofer was eleven her family fled Nazi Germany for Switzerland. She decided she wanted to be a photographer and set about it methodically. She began with an apprenticeship at the Studio Bettina, a portrait studio, and took private lessons with Hans Finsler, one of the pioneers of the "New Objectivity" movement. Hofer's studies covered everything from photographic technique to art theory. She didn't just learn composition and the underlying theories of aesthetics, she also learned the chemistry involved in producing prints. Beginning in the early 1960s she became one of the first fine art photographers to adopt the use of color film and the complicated dye transfer printing process as a regular practice. Throughout her long career, Hofer continued to shoot in both color and black and white – determining which was the more apt for the picture at hand. In the middle 1950s Hofer's career took an important turn when the writer Mary McCarthy asked her to provide the photographs for The Stones of Florence, a literary exploration of the history and culture of that city. Over the next forty years Hofer collaborated with writers including V.S. Pritchett and Jan (James) Morris to produce books on Spain, Dublin, New York City, London, Paris, Switzerland, and Washington, D.C. in which she mixed portraits and land or cityscapes. Working with a cumbersome 4 x 5 inch viewfinder camera, Hofer always photographed her subjects where she found them, but favored carefully composed scenes with a still, timeless aura. Almost in opposition to the on-the-fly work of her contemporaries Eggleston and William Klein, Hofer used extraordinary patience to slow the world down, examine its conditions, and capture the exact image that she envisioned, searching for an "inside value, some interior respect" in the people she photographed. Hofer's goal was to go beyond documentary photography to create a subjective interpretation of the world, conveying both the spirit of the time and a timeless message. A street photographer of a different stripe, Hofer's street pictures convey the artist's concern with sociological connections and offer a pointed look at society and its conditions. Her trades-people and toffs, her families and social groups are more than just intimate portraits – they epitomize the possibilities and restrictions of the human condition. Late in her life, when asked for her thoughts on being called "the most famous unknown photographer in America." she said she liked it. She understood that what mattered was the work, not personal fame.